The episode begins with Sakura daydreaming during class. 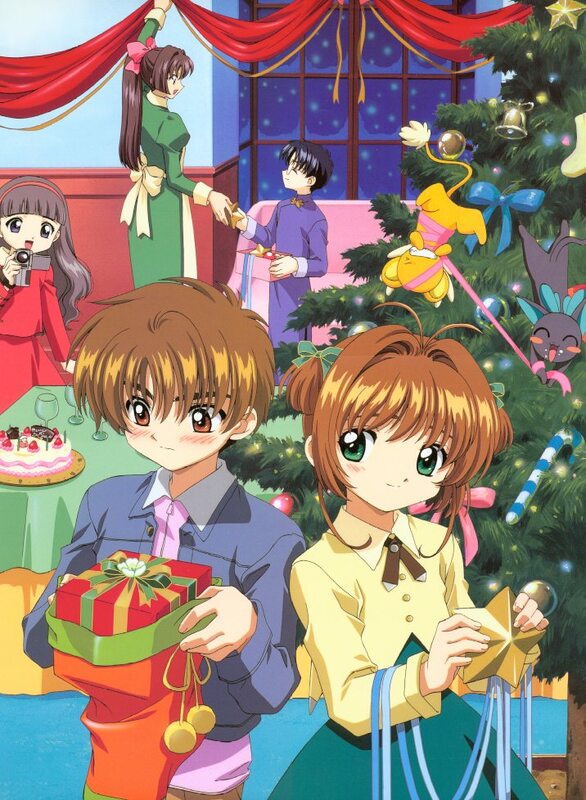 Afterward, she and Tomoyo begin to talk about Christmas, and Sakura wonders what to get Yukito, whose birthday falls on Christmas Day. After getting advice from Meilin, she asks Yukito to go to an amusement park with her, where the two run into Syaoran and Meiling. Unfortunately, the cozy double-date is impeded upon by the Firey card. Really, this episode isn’t chock-full of Christmas imagery. It functions more, I think, as a present to the fans since it’s a “date” episode and the final one of the season, though a major card is captured in the episode. There’s a lot of talk about presents, “Jingle Bells” plays in the background, and a Christmas tree and wreath are among the many decorative elements. The topper is that the episode ends with falling yellow snow?! More on that below. Romance and presents. Okay, the episode’s not that devoid of the true Christmas spirit. As expected of the beloved show, it’s sweet, cute, funny, and has plenty of heart. Meiling, of all characters, expresses the idea that a present should come from the heart, and Sakura’s present took effort, rather than money. It’s a good lesson for all of us during the holiday season – maybe spend less and think more about our gifts to loved ones. On the first day of Christmas, anime gave to me Sakura knitting a nerdy dollie. It’ll be cold, so snuggle up by the fire and read some books. You may want to consult your librarian. Oh, CCS! <3 Seriously. I haven't watched the anime much, but the manga is something I will love forever. Which card is captured in the episode, out of curiosity? It’s the firey card! I wonder if that also happens in the manga during Christmas. Yeah, that’s definitely a very cute part of Christmas anime!